“The strings were tied, it was freshly washed, and maybe even pressed. There is a row of hooks behind the door in my grandmother’s walk-in pantry. Each hook holds a hanger upon which is carefully hung an apron. The pantry is in a newly remodeled section of the house, but the aprons speak of vintage kitchens in older homes of previous generations. Oh the stories they could tell! 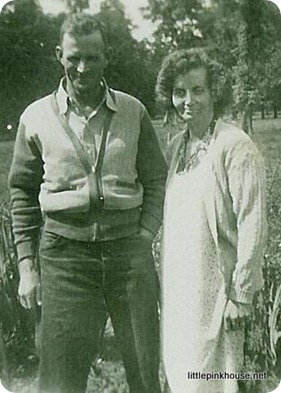 When I think of my maternal grandmother Jessica, I think of the advice the rector gave she and Papa when they went for counseling before their wedding (57 years ago!). He advised them that if Grandma had a bad day, she should turn her apron around backwards, so Papa would know when he walked in the door to be considerate, for her day had been hard. 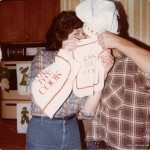 Obviously, the assumption was that Grandma would always be wearing an apron (and she is in the picture above). 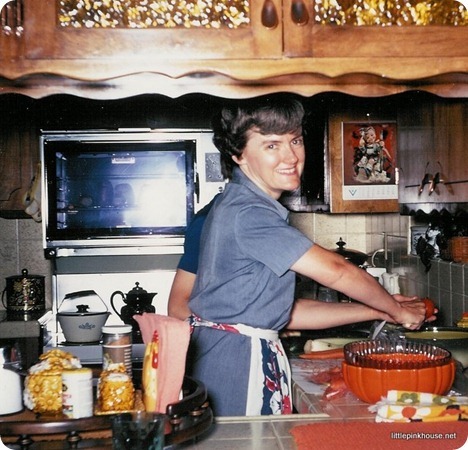 When I think of my maternal grandmother’s mother-in-law—my great grandmother Doris, I see a little adobe house and her little vintage kitchen—just a dim memory now—and the yellow apron I chose from among her things. When I think of my paternal grandmother Mary, I think of how practical she always was—and how she always had aprons handy for hosting potlucks, for doing dishes, and for showing her grandkids the mysteries of cheese and butter. 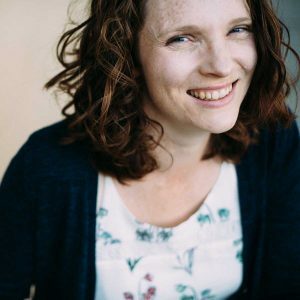 Each time I think of aprons, I remember the pastor’s statement at my mother’s memorial service: “Alma was Christianity in an apron.” That was so true. 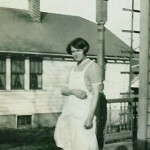 My mother wore aprons most of her 81 years, and she lived a consistent Christian life. Aprons protected from the many daily encounters with ongoing tasks. They came in handy for gathering eggs in the henhouse if a bucket wasn’t handy. A shy child sometimes hid behind a corner of the apron when a stranger was visiting. Tears were easily dried on an apron, although most aprons had a pocket for a handkerchief. If company stopped by unexpectedly, it was easy to slip on a clean apron and feel more presentable before answering the door. 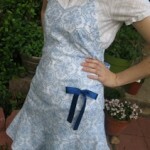 I wore aprons frequently during my teen years, because dresses were the appropriate attire a good portion of the time. When I entered nurse’s training, my uniform consisted of a blue and white checked uniform dress covered by a full white crisply starched apron. The dress could be worn on duty for two or three days, but the apron needed to be fresh, crisp, and spotless at all times. In an emergency while on duty, a spot on the apron (blood or “other” things) could be covered with a piece of white tape until it was possible to get to my room and put on a clean apron. After marriage I wore house dresses most of the time for several years. When I went out to the garden, my apron was used for holding a few ripe tomatoes or perhaps some ripe peas or green beans. A clean apron before mealtime was pretty standard, and then if some outside chores were on the agenda (like milking the cow), it was easy to slip on one that wasn’t fresh, then back into the clean apron to finish out the work day in the house. At the end of a busy day, it was nice to hang up my apron and sit down with the family for a pleasant evening. I liked a full apron, although “half aprons” were popular and more “dressy”. 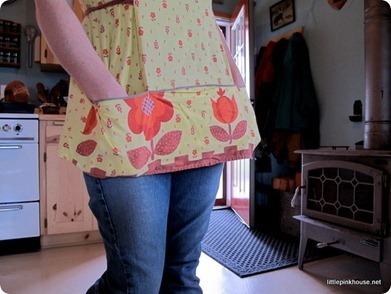 When “cobbler’s aprons” became popular, that became a favorite for me. A full apron went over the head, covered the entire front, and it tied in the back. The cobbler’s apron usually ended slightly below the waistline, so the lap was exposed. 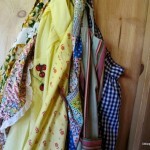 I still have some aprons, but seldom wear an apron unless working in the kitchen with something that might splatter, and then I usually slip on a cobbler’s apron. There is a double hook on the pantry cupboard in our kitchen. It’s overflowing with aprons and with memories. As I pull a treasured apron off the hook, I remember the woman who wore it before me. I tighten my apron strings and try to do my housewifely work in such a way as would make my grandmas proud. 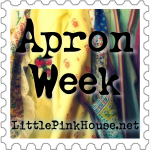 As a fan of vintage aprons, I am really loving this “series” of posts. Oh how fun! One of my dad’s cousins just shared a story about how her 11-year-old son, after Great Grandma Alma’s death, wanted to know which apron Great Grandma would be wearing for her funeral. Obviously, she wore them all the time.